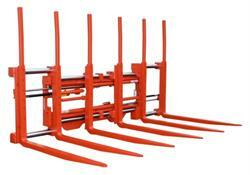 The benefits of the MEYER 3/2/1 Pallet Handler Generation G are immediately noticeable: the excellent visibility in all loading situations catches the eye of the driver in the truest sense of the meaning - the highly synchronous fork arm travel and the fast opening and closing speeds provide for an efficient positioning of the forks and prevents damage being caused at the same time. 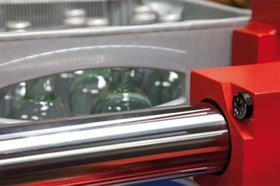 This significantly increases the pallet turnover and helps to reduce costs. The intelligent design creates the basis for an optimum of residual capacities of the forklift truck in order to ensure an optimal utilisation of the pallets that are to be transported. The high stability of the MEYER Shaft Guide Concept also provides support in the toughest conditions: fully loaded pallets remain securely on the fork arms during transportation and at high speeds - the driver notices this immediately: the MEYER 3/2/1 Pallet Handler especially ensures a high level of safety and provides optimal ergonomics. Long maintenance intervals substantially contribute to the reduction of the overall life cycle costs of an attachment, in particular in multiple shift and fleet operations. This is where MEYER Pallet Handlers score with their high standard of 1,000 hours maintenance intervals - maintenance intervals that can even be doubled through the optional automatic permanent lubrication system. Only the unique and completely encapsulated MEYER Shaft Guide Concept provides a permanent lubrication system for both attachment functions, the sideshift and the fork arm movement, providing exceptional maintenance intervals that allow extended operating times for an increased pallet turnaround. In the middle of the Eighties Hans H. Meyer GmbH had already begun the development of the Shaft Guide Concept for forklift truck attachments, which lead to the introduction of the first shaft-guided Multiple Pallet Handler. From the beginning to date, solid material precision-machined and hard-chromed shafts, in combination with long-life bushings (encapsulated with shaft wiper seals) provided for excellent smooth movement characteristics with fast operation speed, and equal fork travel. The long-life bushings with their extended life require a minimum of maintenance, which, with its optimised TCO, predestines this Pallet Handler design for full-maintenance and fleet operations. The MEYER 3/2/1 Pallet Handler Generation G combines enhanced efficiency with an optimum of life cycle costs and complies with highest ecological standards at the same time. 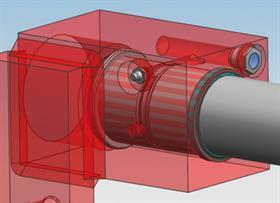 The fully encapsulated MEYER Shaft Guide Concept - other than any conventional open profile systems, prevents grease from emerging - not only ensures for clean beverage containers and prevents floors and the environment from being contaminated, the encapsulated system also prevents the usual agglomeration of grease and dirt, resulting in a minimum of wear of the long-life bushings. The low friction within the MEYER Shaft Guide Concept significantly reduces the energy demand, resulting in a lower fuel consumption and extended charging cycles of electric forklift trucks. Not only that: the low friction also prolongs the service life of the wearing components and minimises the lubricant requirement. The MEYER 3/2/1 Pallet Handler Generation "G" stands for greater efficiency, a clean and safe transportation and a conservation of resources with optimized lifetime costs, providing a unique solution for the optimization of logistics processes.